OK eyepiece hooligans, here is a trivia question for ya. I have 3 TV circle R (Japan) plossls: 15mm non-smoothie, 17mm smoothie, 21mm smoothie. I just purchased a Celestron silvertop circle R plossl from a fellow CN'er. Are the (Japan) Celestron circle R's brothers, sisters, or cousins to the TV? They look strikingly similar in construction in photos--except for the color of course. BTW, I have been really impressed with the TV smoothie plossls. The 15mm non-smoothie I have is really tight on eye relief. I use it with the rubber eyecup folded down. They were produced by the same Optics house in Japan, @ late 80's. That is good to know. The 26mm TV smoothie has a good rep. 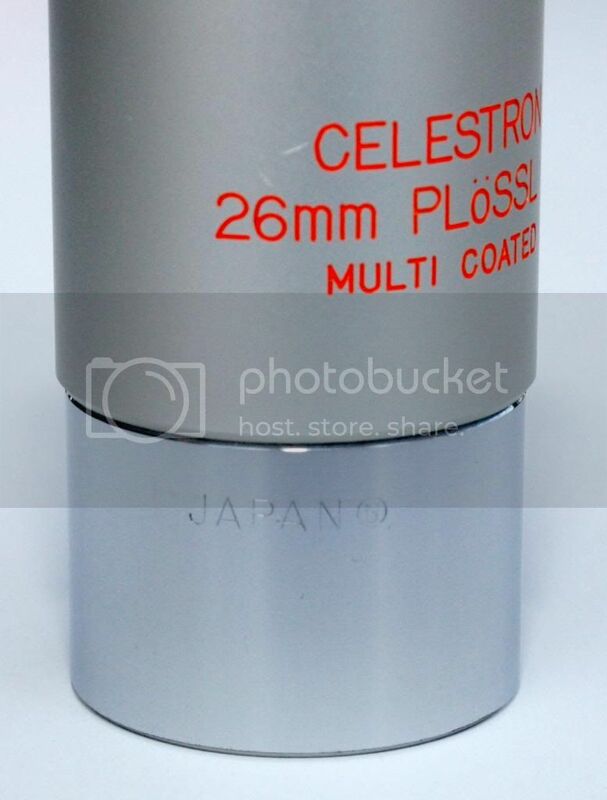 Anyone ever compared the 26mm TV smoothie Plossl to the Celestron silvertop smoothie--circle R? I am unfamiliar with a Celestron Circle-R Silvertop. What is the focal length? Can you provide a picture (that will help me better answer your question)? PS There are two known barrel markings for Celestron Silvertops - Circle-V (Vixen) and Circle-NJ (a production error). Supersize the photo on the far right. Looks to me Circle R engraved. I apologize if this is an error on my part, but it sure looks like Circle R in the pic. Thanks. Let me know when you receive it from the seller. It's likely either a Circle-V or possibly a Circle-NJ. Or maybe you've found another variation. The angle is too steep to be sure from this photo. Keep us posted! I believe that the OP is referring to the symbol to the right of "JAPAN". I have compared the above eyepieces, all made in Japan: 26mm Meade 4000, 25mm Meade 3000, 26mm Celestron (NJ), and 26mm Tele Vue ®. I look ed at them in a number of scopes through out the course of last year. Thinking I write up a formal review, I have pages and pages of notes. Bottom line is the now the Tele Vue ride in my field case. I'll try and get a review written up this week... However, I've been saying that for a while. I'm certain (but could always be wrong ) the Circle-R is for Registered Trademark (as in Tele Vue) - my TV ep's and parts all have Tele Vue®. 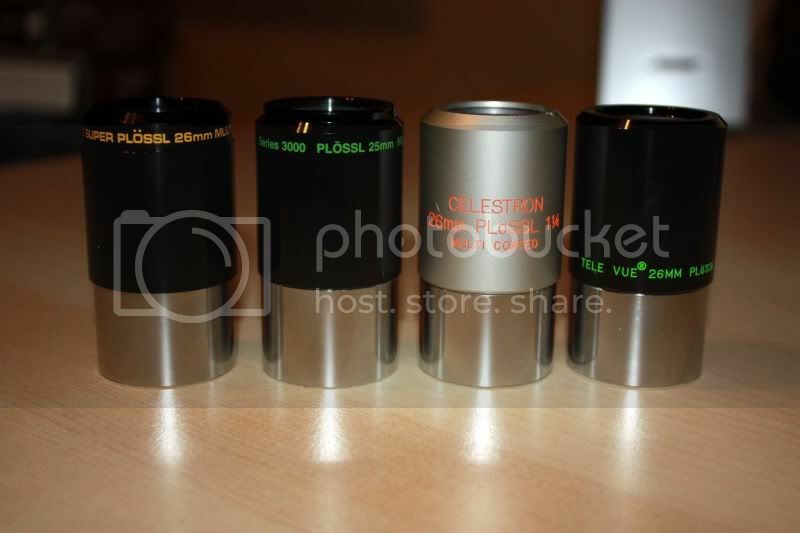 The Celestron Silver tops that I have have Circle V after the Japan stamp, which would indicate Vixen sourced. What am I missing? The "Circle R" is the "Registered Trademark" symbol. I copied the image to a photo editor and then played with the contrast and brightness and then the focus. What I see is a Circle N.
That is quite a find. Imagine a Celestron Silvertop built to Tele Vue quality standards and that is what you have. Nice to see another one of these in play so to speak. And a nice find, to be sure! It may come out of the same optics house... but to the same standards as Tele Vue, not in my experience. From the sound of it all, I mistakenly made a connection that wasn't there. I always thought circle R was a indication of a trademark until reading on the eyepiece forums about circle T, circle N, and I believe in some instances discussions about "circle R" eyepieces. I guess I wrongly assumed the circle R had a sourcing significance. I will follow up when the EP arrives to let you guys know for sure what it is. Tele Vue Plossls are not orthoscopic, trading distortion for improved astigmatism control (I believe Al Nagler had a patent on the design). I would suspect the Celestron one is the traditional symmetrical design. One way to find out is to see if the field lens is concave toward the eye which would indicate the Tele Vue design. The newer Astro-Tech/Sterling plossls seem to resemble Tele Vue ones (similar concave field lens and distortion in image but wider AFOV) and the performance of the 25mm and 17mm ones is very good (the 6mm one not so much). The TV 26mm was a little better than my silvertop 26mm The TV had better edge correction and was a tad sharper. I rcal the silvertop had a flat eyelens where the TV is slightly concave. Funny thing is, I had a really early 26mm TV with a flat eye lens and it's edge correction was like the Silvertop. I actually call Al about the edge correction, and he told me that the patented design just got there, and that was the first run, he traded it out for me.